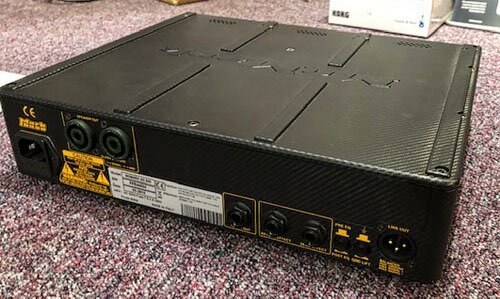 •Pre-owned 800w amplifier in superb condition with twin inputs, 7 band graphic eq and VLE/VPF filters. 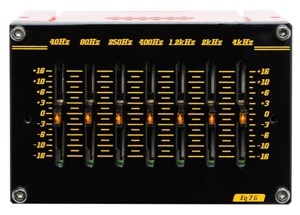 The stylish Eq7G module features seven bands of graphic equalisation, set at 40 Hz, 80 Hz, 250 Hz, 400 Hz, 1 kHz, 2 kHz, and 4 kHz. Illuminated by yellow LEDs, this graphic EQ allows you to "see" your tone shaping on any dark stage! 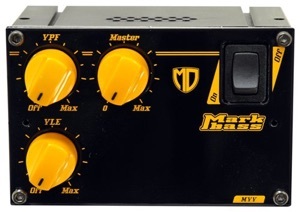 The MVV module features the two trademark Markbass filters: VLE (Vintage Loudspeaker Emulator) and VPF (Variable Preshape Filter). These handy controls allow you to access a wide range of timbres, from vintage tones to modern hi-fi sounds. 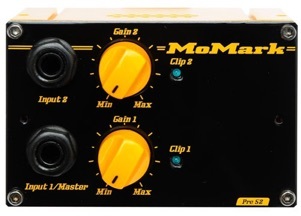 Many bassists find that these two filters are a practical solution for changing their sound in a simple and musical way, without fiddling with EQ controls. The new bi-band limiter is more natural and dynamic, especially when playing at high volumes. Designed for flexibility, the S2 solid-state preamp module features two input channels with gain control and clip LED for each. Set separate levels for two basses(i.e. an electric and an acoustic) or use one of the inputs for your instrument and the other for a drum machine, laptop, keyboard or bass pedals!